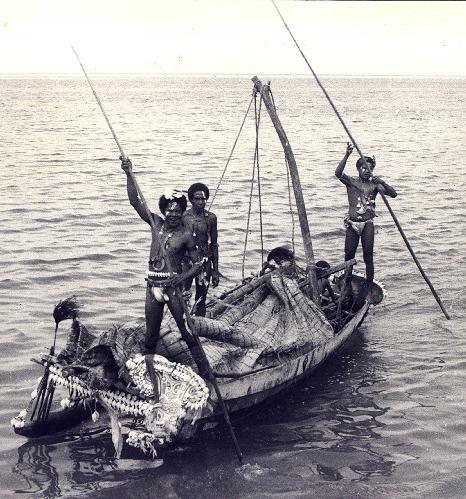 The Trobriand Islanders, off the east coast of New Guinea, constitute the subjects of one of the earliest works of ethnography and economic anthropology authored by Bronislaw Malinowski, a major figure in the discipline (Malikowsi 1922). He identified several unique and fascinating economic institutions within Trobriand society but the "kula ring" has attracted the most attention. This system of exchange involves annual inter-island visits between trading partners who exchange highly valued shell ornaments. the other to whom he makes the reverse exchange of an armband for a necklace. Although each individual is tied to only two other partners, each contact has an additional connection on either end of the distribution chain, which eventually forms a great circle linking more than a dozen islands over hundreds of miles of ocean. Malinowski considers the motivation for the enormous expenditure of time and effort involved in kula expeditions to be fundamentally non-utilitarian "in that they [the kula valuables] are merely possessed for the sake of possession itself, and the ownership of them with the ensuing renown is the main source of their value". However, the development of kula partnerships has many social implications. They reinforce status and authority distinctions, since the hereditary chiefs own the most important shell valuables and assume the responsibility for organizing and directing ocean voyages.